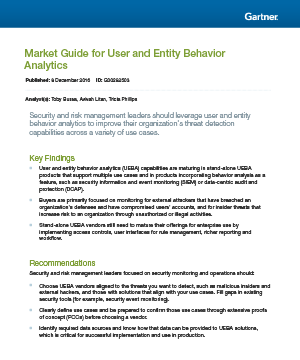 It's official: When it comes to improving threat detection, Gartner is down with User Behavior Analytics. Though it's no surprise, really—User Behavior Analytics (also known as User and Entity Behavior Analytics) applies insight to the millions of network events users generate every day to help detect the use of stolen credentials, lateral movement, and other stealthy, malicious activity earlier in the attack chain. It saves time and finds the attacks you're missing. Get a quick primer on User Behavior Analytics, find out why Gartner recommends it, and learn how to pick the perfect UBA vendor for your organization—download your free toolkit now! Get to know UBA – what it is, where it works, and why Gartner recommends it – in this thorough exploration from the industry experts. Ready to get started? 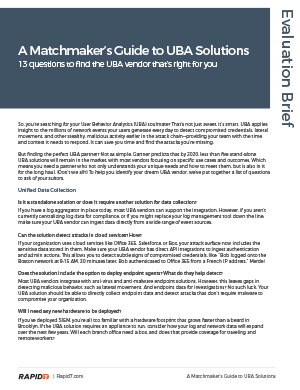 Here are 13 questions you should ask all potential UBA partners to help find the vendor that’s right for your organization—today and down the line. Hungry for more? Get quick answers to common questions about User Behavior Analytics – as well as InsightIDR, Rapid7’s solution for incident detection and response – in this helpful webcast.